A couple of months ago Popflex released their new Dark Bloom collection. One of the pieces that caught my eye is the Queen's Coat. The price is quite affordable. The coat is $84. The smallest size is a 2 and I don't know if it's petite friendly. Often peplum styles do not work for my short torso. 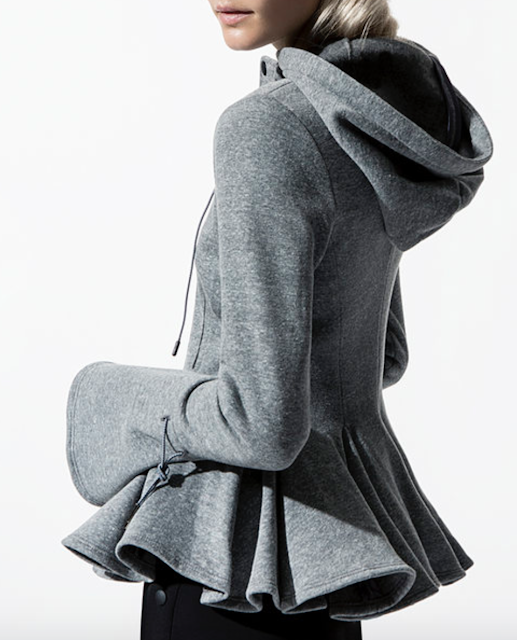 But this jacket looks super cute. It also looks like it's scuba material. I'm unsure if I would find the jacket comfortable to wear. There's also another peplum style hoodie that caught my eye from Carbon38 this week. This one is all gray and a little bit more my style. The Popflex looks a little too frilly for my tastes but it does look really cute. I'm loving the bell sleeves and that it has a hood. But for $355, I'm not sure if it's worth that kind of money. What do you think of these two peplum jackets? Yay or Nay? My birthday is coming up so I might give one a try. I just missed the Carbon38 anniversary sale that happened a couple of days ago, they were giving 20% off your purchase. Gah. I agree for the price the Mead Jacket isn't worth the money... sigh. I'm okay with the fabric, I don't usually get cold to easily since it's Atlanta. Maybe I'll try the Popflex version. Thanks for your input!